What kind of ceremonies do you do? Our mainstay is the wedding/commitment ceremony. However, we believe in the value of setting apart many special occasions by creating memorable ceremonies to mark them. Most of these events center around transitions: birth, death, graduation, partnership, coming out... even amicable divorce. Our willingness to compose and/or conduct a meaningful ceremony is limited only by the desire and imagination of the people who hire us. Recently, we have done quite a few baby namings. How far in advance do you book a ceremony? Generally, anywhere from two to eight months. We are flexible with dates before and after that as well; much depends on the nature of the ceremony and how much creative time we need to compose it. We are also open to last minute needs and spontaneous weddings! Receiving a deposit for half the cost of your ceremony is our standard protocol for locking in your particular date. 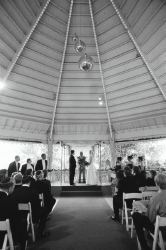 Do you do non-religious ceremonies? Yes. We have a strong spiritual orientation to life, and so we conduct what we consider to be spiritual ceremonies. However, in our frame of reference, "spiritual" means affirming the deep experience of life's mystery and wonder. We have conducted ceremonies for those who self-label as humanist; in doing so we have left out referrals to God in His/Her many names, still producing meaningful and emotionally moving results. Can we help write the ceremony? Absolutely! 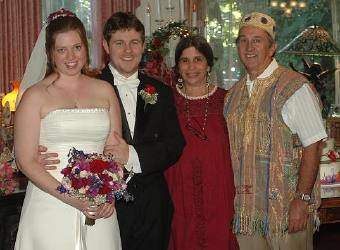 We help people write their own ceremonies by being a catalyst; that is, by presenting them with resources, including past ceremonies. We are there to provide ideas and encouragement when people get bogged down. Some people come with lots of ideas and others need to be made aware of the possibilities. We want to help you create a ceremony that you find personally meaningful. What is the purpose of the initial interview? In chatting and asking one another questions we all get a sense of whether or not we are a good "fit" for what you have in mind. We will show you examples of ceremonies we have done in the past, both to stimulate your notion of what is possible and to get your own creative juices flowing. That first face-to-face interview is the simplest and most direct way to establish a mutual level of comfort which gives everyone a solid basis from which to proceed. We enjoy our work and take it seriously; if you hire us,we want you to be at ease with your decision from beginning to end. Do you do interviews over the telephone? If you are out of town, we are always happy to conduct the initial interview over the phone. Then, if you decide to use our services and are in town sometime before the wedding, we are happy to arrange a face-to-face meeting and get to know each other a little better before the ceremony. 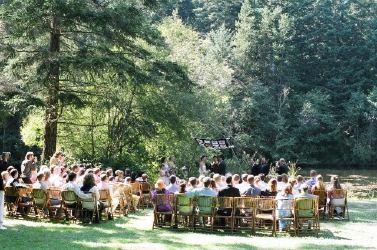 We recently performed a wedding in the San Juan Islands. The couple paid for all our travel and lodging expenses. We are international travelers - and so are happy to travel anywhere as long as our expenses are covered. Yes, we are happy to help you prepare for your wedding by conducting your wedding rehearsal. Our rates depend on the nature of the ceremony, your budget, as well as location, rehearsal, and other elements that might result in an increase in the time needed to prepare or perform the ceremony. The initial interview is always free.